Eh....sorry about that blogging break. I will probably never catch up, but wanted to finish documenting Disney! Well, this is where things went down for me. The morning started out great. The kids looked so cute in their matching outfits. It was an awesome moment. It was getting really hot (to me) and Mae Stanley was melting so we went to the Baby Center for a feeding. (It only took me four hours to find it.) The boys went with Brooks and my parents to ride a ride. Then we met up to ride Nemo. I didn't know if it was the heat or that I was worried about Brooks, but I started to feel sick. We got a coke to see if it would help (it didn't), but I knew we had a FastPass to meet Mickey and Friends, so I was insisting that we stay. We walked around some, and I was trying to keep it together for another two hours. Then, my "Disney Miracle" happened. Randomly, there was Mickey, Donald, Goofy, and Pluto for pictures! With no line! We happily met each one, and I felt less guilty about leaving knowing they saw Mickey and Friends. Woody stayed with my parents, but Brooks, Gaines, Mae Stanley and I headed back a little before lunch. I thought I could take a nap and feel better, but when I woke up, I realized that I had a stomach virus/food poisoning. It felt like a stomach virus, but luckily, no one else got it! I spent the next 30 ish hours in bed. Whomp whomp. Thank you to my incredible husband and parents for helping with the kids. It is the worst to be in the happiest place on earth and can't leave the bed. I don't know what I would have done without them. 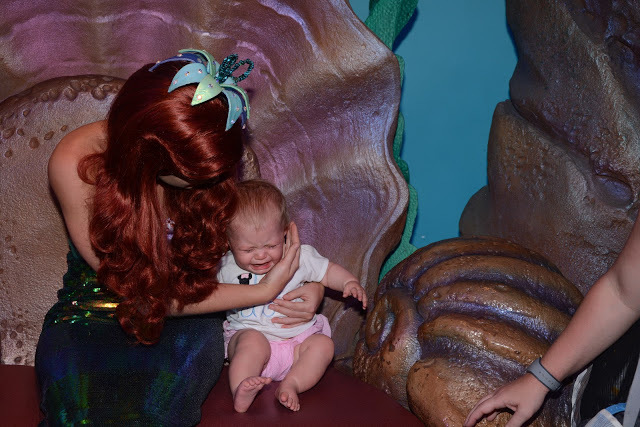 For a more fun recap of Epcot Day, read Sister's account. For our second day at Disney, we were going to the Magic Kingdom. We got there before the park opened because we are Hollons and believe in getting the most of our tickets in hopes of getting some of the popular attractions knocked out. This picture with all the grandkids and Nana cracks me up. Since we were just waiting around, I decided to go ahead and feed Mae Stanley at the Baby Center. I made it back right before they let us into the rides, and we headed for Splash Mountain. 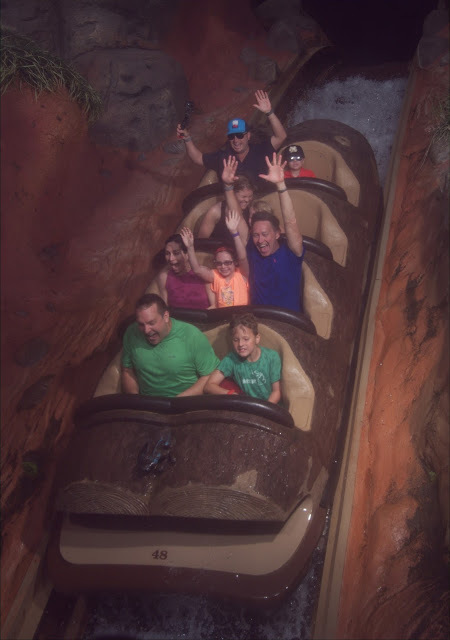 Gaines had been talking so big about how he wanted to ride Splash Mountain. We watched YouTube videos every night so he could watch the ride. If you asked him about Disney, he talked about how he was going to ride Splash Mountain. I was nervous that he wouldn't be tall enough. Since he was tall enough for Star Tours the day before, my fingers were crossed he would still measure 40 inches. (They measured him twice at Star Tours.) Wouldn't you know they didn't measure him once for Splash Mountain! I was holding on to him for dear life! Thank you, Sister, for holding Mae Stanley while we did this ride. After this ride, we headed to do Peter Pan. Woody wanted to ride with Jake, so we rode with Gaines and Mae Stanley. Gaines cried because at the last minute he wanted to ride with Uncle Billy, but it was too late, and Mae Stanley freaked out when it got dark and cried the whole time. It was magical. Woody really didn't want to leave Jake, so we hung out with Jake, Nana, and Gran a little while. I made the boys take these great pictures. I knew Jake had some FastPasses for some roller coasters, so I had to pry Woody away. We went to ride the Barnstormer, which was their favorite last time we were at Disney. Well....I will let this video show show how Gaines handled it. But Woody loved it! I have one daredevil and one scaredy cat! 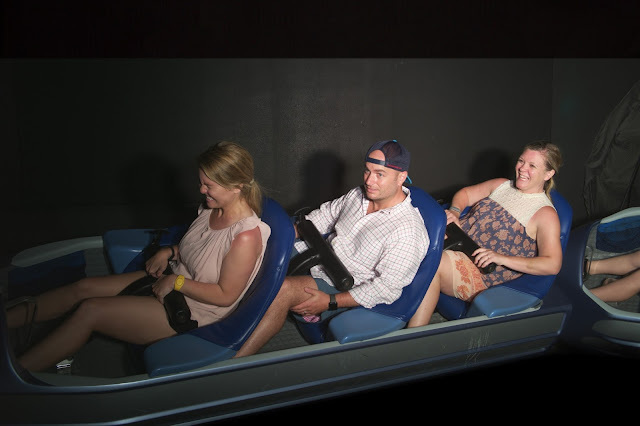 We had FastPasses to ride the Seven Dwarfs ride, but it was broken (just like the last time!) While we were figuring this out, Sister took Mae Stanley with Hollon to meet with Ariel. After that, we headed back to the hotel for naps, showers, and dinner. My parents were so sweet and agreed to watch all of our kids (plus Hollon) while we went to back to the Magic Kingdom. We met up with Robbie, Emma, and Jake and rode the Haunted Mansion and the Mountains (Splash, Thunder, and Space.) We had so much fun and stayed out until 1:00am thanks to Magic Hours. I obviously do an amazing job in keeping a brave face. It was a wonderful Day 2! See Sister's Recap of Day 2 Here. If you follow Sister's blog you know that the end of May/first of June my parents took the entire family on a special trip to Disney World! On Memorial Day, we flew down with Sister's family, while my parents and my brother's family drove down. The week before, Mae Stanley had n ear infection and was still on a antibiotic that upset her tummy. Her first blowout came in the middle of security. Awesome. We boarded the plane and due to weather, had about an hour delay. Surprisingly, everyone kept their cool for the most part. Blowout #2 happened on the plane! She got to wear a too small sleeper for the last ten minutes of the flight. We landed in Orlando and took the Magical Express. This was so nice because we didn't have to worry about our check luggage. Unfortunately, I plopped Mae Stanley in the seat next to Gaines will I rearranged and didn't realize Gaines had spilled his water bottle in the seat. Yep, another outfit change. This time she got to wear Hollon's 2T dress. That night we just walked around Disney Springs and ate a quick dinner. All my kids were tired and we knew we had an early morning, so my family and my parents headed back. Our first full day was at Hollywood Studios. We had made reservations at Hollywood and Vine for breakfast. 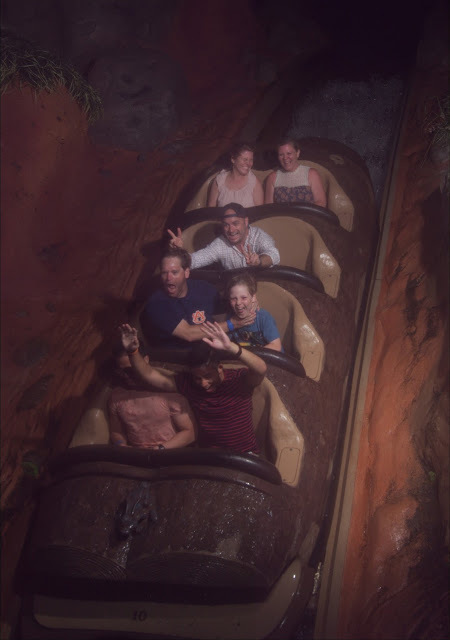 I was excited because Woody enjoyed this last time we were here. Also, since our reservation was before the park technically opened, we would have first dibs at the Jedi Training Camp. (Jake really wanted todo this last time they were at Disney and didn't get it. I may or may not have cried for him.) After we got in the park, Emma and Brooks took Jake and Woody and were able to be he first to sign up. Then we were able to enjoy breakfast. Our first Fast Pass was for Toy Story Mania. Everyone except Brooks, Gaines, Mae, Stanley and me rode first, then we traded Mae Stanley out and the three of us rode. Poor G was already hot. We had to remind him several times not to undress. Then it was time for Jake and Woody to do the Jedi Training Camp. After, we split up. Brooks took Woody and I took Gaines and Mae Stanley and headed off with Mom, Sister, and Hollon. We did the Little Mermaid show. Gaines and Mae Stanley cried. Then we headed to Disney Jr Live. After the show, we headed back to the resort. Woody hung out in my mom and dad's room, Mae Stanley took a brief nap, and we took Gaines to the pool and splash pad. Then we cleaned up and headed back to Hollywood Studios around dinner time. Brooks and Woody had been on Star Tours earlier, so we decided to go back on it with Gaines. He was just tall enough! Gaines is totally a chicken, so I figured he would cry (especially since he didn't take a nap that day.) However, he was a rockstar! Woody and Gaines laughed so hard on it. Thanks Mom and Dad for watching Mae Stanley during this! Of course Brooks bought them light sabers after, let them take them out of the box, and have a fight in the middle of Hollywood Studios. We got another Fast Pass for Toy Story, so we rode that again. We wanted to stay for the fireworks, but a storm was rolling in and Mae Stanley was tired and hungry, so we headed back. Thankfully, everyone crashed (after a quick bath!) Such a great day at Disney! - Weight: We went to the dr due to an ear infection and she was just under 18lbs. - Sleep: She still isn't an awesome napper. Some days are better than others. Her naps are at 9ish, 1ish, and a late afternoon catnap. She naps anywhere from 30 minutes to sometime 2 hours. If she only sleeps 30-45 minutes, I make her stay in her crib to an hour. Her late catnap is only 20-30 minutes. She is a FANTASTIC night sleeper (knock on wood.) She goes down between 6:00pm-7:00pm. She usually wakes between 5:00am-6:00am for an early breakfast and then goes back to sleep for two to three more hours. I am so thankful she sleeps well at night. If I had to pick, I would always choose night sleep! - Eat: Loves food, especially feeding herself. The weird reactions have stopped. She likes everything except avocado (how is she my child?!) She goes 4 hours between nursing feedings most of the time. She likes water or breastmilk in a sippy cup too. - She is sitting up. She randomly will tumble over sometimes, so I put the Boppy behind her and pillows all around her. - First black eye....She was trying to crawl and face-planted. She can scoot backwards pretty good. - Has the deepest laugh...cracks me up! - Center of attention. Mae Stanley needs an audience 24/7. - Most of her waking hours are spent on my left hip. When we weren't baptizing Mae Stanley or celebrating Easter, we had many other nice moments worth documenting. After Mae Stanley's baptism, my parents took the boys with them for some time on the farm. We always miss them, but Mae Stanley especially missed them. She was so excited when we saw them, and she spent the entire car ride leaning forward so she could see her brothers. I also took the boys to get their first "non-mom" haircut. One Saturday I had to work at church for VBS. I could have brought the boys with me, but Brooks insisted on keeping them. He got them dressed and took them for a Guys' Hike. I love how close they are. Woody takes his role of big brother very seriously. He loves to help and is very protective. He likes to help read Mae Stanley her bedtime story. One Friday night, we took the kids to "Lemonade Days" which is the little fair that comes once a year to Dunwoody. The boys had such a great time, and I managed not to completely freak out on the Ferris Wheel when they kept leaning over the side. Ha! Gaines's big ole head would whip around every corner. Baseball has been such an unexpected blessing. 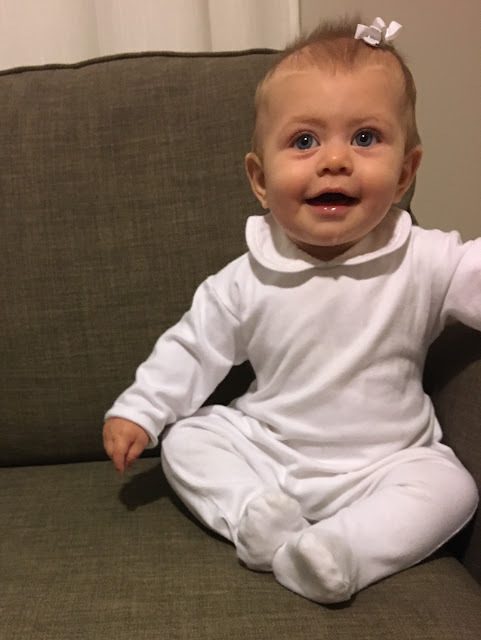 Woody has loves the boys on his team, his coaches, and learning to play. I melted when I found him asleep with his baseball cap. You guys, these boys! Melt! Can we say heart eyes?! That day we had Gaines's music performance and Woody invited me to be his special friend for Doughnut Day. I was so honored, until Woody admitted in the car that he wished he had invited Daddy. She will ALWAYS feel loved! We ended the month on a weekend trip to see my sister in Birmingham. We all had the best time. The boys are obsessed with Jake and quite intimidated by Hollon. It was great watching them play and getting quality time with them. Both boys slept in Jake's room and thought it was the greatest thing ever. But not quite as great as when Gaines got hit with pie! Christian, wife, mom. Love good times and garden gnomes. Oh, and I am a really bad cook. Pretty much sums me up. ©Lindsey Harvard and Teach Chic, 2011-2016. Unauthorized use and/or duplication of this material without written express and written permission from this blog's author is strictly prohibited. 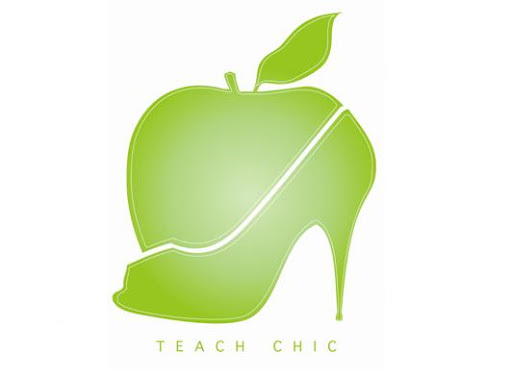 Excerpts and links may be used, provided that full and clear credit is given to Lindsey Harvard and Teach Chic with appropriate and specific direction to the original content.